Today I wore this new dress that I purchased from off of the HSN website. I have had my eye on it for months and it went on sale recently. It’s called the “Bird of Paradise” dress by Very Vallbracht. I ordered it because of the vibrant hue of red with the bird print. The bird print is on the front and the backside of the dress. I ordered the size 2X and it hits right above my knees. The dress is made of a silky stretch red charmeuse with a side zip and side vent. I paired the dress with my Charlotte Russe 5 inch pumps. 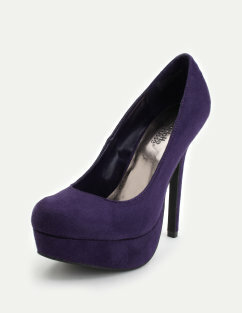 (Yes, I said 5 inches but they are really comfortable because of the platform). I wore the black pair at first, then changed into my purple pair later on in the day. I haven’t really worn heels in weeks but these were just fine. They look more intimidating than they really are. Since I was in church, to make the ensemble more appropriate, I added my black Torrid jacket to dress it up. This jacket has become my everyday jacket as it is so versatile to dress both up or down.